Faux Suede Fringe Slide Sandal ($19) - A super fun shoe at a fun price is hard to resist. 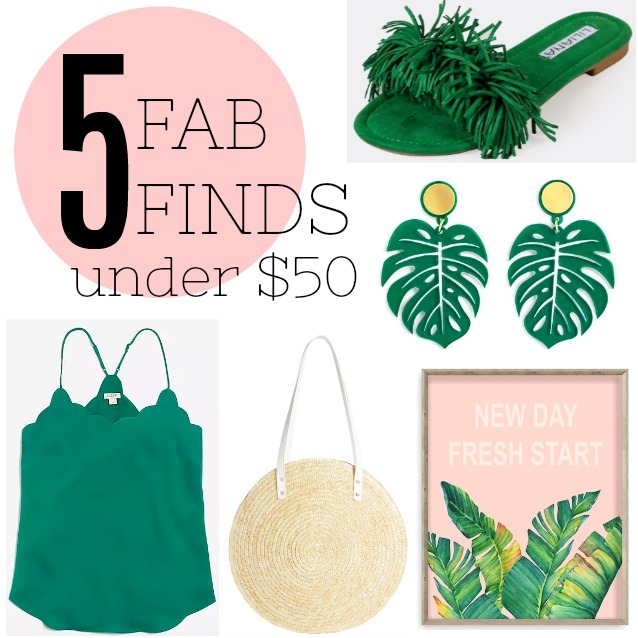 This fringe sandal is combines fun and function and the emerald color will take you well into fall. For $19, it's hard to say no to this one. Palm Leaf Earrings ($36) - The hits just keep coming! Oh, how I love these palm leaf earrings. They are so cute and summery and go with every single outfit you wear. New Day Fresh Start Shadowbox ($17) - Complete that empty space in your home with this pretty shadowbox. Bonus: it serves as daily inspiration. Circle Straw Bag ($49) - Go from beach to chic with this on trend circular straw bag with faux leather handles. Scalloped Cami Top ($30) - Wear this cute top alone or with a jacket or cardigan. Either way, you'll love it so much that you'll probably end up ordering it in every color.